In my house, we’ve started being very diligent about ready to the kids every night before bedtime. One night I sit at Anna’s bedside and she gets to see the pictures while Matias listens and the next night we switch. After a few weeks of this, we ran out of books. Rather than buy more used kids books on Amazon.com which I’ve done in the past, I decided it was time to introduce the kids to an unlimited selection of books of all subjects, the public library. After work one day, I picked up the kids as usual. Knowing that my wife was running late leaving work, I figured the kids and I had enough time to stop in to the library before dinner. Although standing in line quietly is not their forte’, I managed to leave the front desk with a library card, which we promptly took to the children section and grabbed six books that would sustain us for a week or so. Getting a library card was easy, didn’t cost me anything, and now we have a new adventure we can go on together. Later that evening I got around to reading the information packet the library provided about the various summer programs and services they offer, and I ran across a section about Overdrive.com, their online lending platform. With overdrive you could borrow eBooks and audio books, my preferred format, all from the comfort of your own home. Nice! After downloading the Overdrive app on my Android, I searched and found my local library which I added to my account. After the account was setup, I was able to search, filter, and borrow books up to my limit of fifteen, which the library had set. Since my brain isn’t complex enough to listen to more than one audio book in parallel, I keep my borrowing down to one or two audio books at a time. Once you find the book you want to borrow, the process is pretty straight forward, enter your library card number, and click ‘Borrow’. If the book is unavailable you will be presented with a ‘Place Hold’ button which, just like a traditional library, put your name on the list to receive the book once it is returned. Since all audio books are automatically checked back in at their due date, the longest you should have to wait is 21 days, if you are first in the hold queue. Twenty-one days is my library’s max checkout time for digital media, your’s may vary. One thing to watch for is when placing a hold, you are provided with an option to ‘Check out immediately once available’ which is nice, unless you already have a few checked out, then you’re just wasting time with it in your account, which could be used by someone else actually ready for the book. This is more of a ‘be kind to other readers’ tip, rather than ‘do not do this it is evil’ type tip. I really like the fact that I can cancel my $14.95 a month Audible.com membership and get the same similar benefits for free from my local library. Edit: I actually downgraded to the $9.95 a year plan rather than a full cancellation ,which allows me to share books with other Audible.com members. This plan is not present on their membership page, but was presented during cancellation. This plan allows for continued discounts on purchases as well as for continued borrowing of books among members, which is nice for books the library doesn’t have. If you aren’t a member of your local library, by all means, get down there and say hi. While you’re there, ask if they have Overdrive for online lending, your commute will thank you. Having led a care-free existence since birth, I always assumed that kids were for everyone else. While skilled in the art of making said creatures, I never settled on the idea of having my own. Occasionally I would have the thoughts, but never really had the partner I thought would be compatible enough to attempt on that epic journey. Just shy of five years ago, I met a young lady that would change my life, reel me in and make me the happiest I’ve ever been. In that time we’ve made not one, but two of the little creatures referenced above. We’ve been through good times, scary times, joyful times and just daily life times, all of those times I cherish. What is so amazing to me, is what appears to a single man to be a complete upheaval of everything you consider normal in your life with the introduction of a child, is just that. It is an upheaval, a madness, things completely new, but as it turns out, most of what was filling your time before was nothing more than empty fluff. The true joy of life the people we choose to surround ourselves with. It is watching my baby girl turn two today. A little girl whom I struggle to say no to, a little girl whom I wasn’t sure I could handle two years ago, a little girl who holds every piece of my heart in her devilish little hands. This is life, and it is good. While being father does not define my existence, it complete me. It has made me a better man, a better friend, and a better partner. Thank you Natalie for accompanying me into the next level of adulthood. I can’t wait to grow old with you to see what our little creatures have in store for us next. Thank you Matias for all that you have and will teach me. Thank you Anna for spicing up our lives just a little more than we expected. Growing up with the desire to study law, but not the dedication nor drive to obtain a Juris Doctorate, I have replaced those desires with a strong interest in politics and law through all levels of government. I find my self reading more books, and in this case, listening to audio books, on the subject. This wrongful death olympia wa is very important because it can cost thousands of dollars just to get to a point where your worker’s compensation case will be heard by a magistrate. 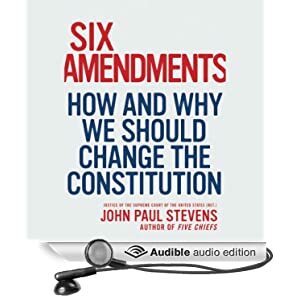 This book contains the words of retired Justice John Paul Stevens about the six issues which he proposes that we fix with amendments to the Constitution. The audio book is a short 3:42 listen. It is a good smooth listen, but can be fast tracked at times requiring me to re-listen to a few sections to ensure I got the references and their meanings correct. The six issues are presented in a more concise well written method than I could provide over here. I’ll simply add my thoughts to each below. “Anti-Commandeering Rule” – I cannot agree with this suggestion as proposed as I feel that a locally elected official has a more direct relationship with those they serve, and ignoring a federally enacted rule or law can be an act of protest. The current issues outlined in this book I believe are acceptable, and need no further assistance from the Constitution. “Political Gerrymandering” I fully support a law restricting this practice, as politicians will continue to be politicians who will continue to politic and do things that are both questionable and in their favor, this amendment could assist with those issues. “Campaign Finance” While I believe the proposed solution is decent, I could imagine where the dominant party in power could further restrict the speech (spending) of those not in power through rule making, which could make the situation just as bad as it is now. Corporate money in politics is bad (epic proportions at this point) and must be regulated, but with due caution in mind. “Sovereign Immunity” On its cover, I think I support this one. There is no reason that agents of the state are protected from their actions of doing so. The only thing I fear is the flow of tort actions this would result in. I don’t like blank protections for any class of people, especially the state itself. Should this be pushed on the federal government as well? I’m not sure, but this is a start. “Death Penalty” I don’t believe that the Death Penalty serves the purpose that it once did in the past. With the 20 year waits for executions, the deterrence factor of the death penalty is simply useless. The excessive cost of holding death row prisoners over regular life prisoners is also not warranted either, I can agree with the addition of these five words. “The Second Amendment” With the power the Department of Defense has over State’s National Guard units, I don’t see how stripping 2nd Amendment protections to individuals, and relegating those only to the ‘state militia’ is any less than fully revoking the 2nd amendment. This is the most absurd recommendation I’ve seen yet. Overall I enjoyed the book, not so much the message. I am a fiscal conservative and social moderate, which is mostly where Justice Steven’s opinions floated towards the beginning of his career, but as we can see from his opinions over his later years, and in retirement, he has changed more towards a federalist leaning position. Thanks for your service, and the book I guess. It is nice to remember that where ever you may be reading this entry, you are more fortunate and well off than the majority of the world. While we all have our trials and tribulations, we must keep those in perspective to the world as a whole. Take pride in your past accomplishments that have propelled you to where you are today. A few minutes of self-reflection can be quite rewarding. Welcome back to our Directory of Jason project. For this installment, we look at one of the more famous (in some circles) Jason Carter. This Jason Carter will be known to folks familiar with blue grass as he plays fiddle in the Del McCoury Band. Jason was determined to be born in February, and made a most expeditious entrance to the world on February 1, 1973. Being born and raised in Kentucky, Jason was surrounded by pickers and singers for the majority of his life. He learned guitar and mandolin from his father starting in grade school and picked up fiddle in high school after hearing Del McCoury play at a bluegrass festival. Jason made his way to Nashville destined to be in a world-class bluegrass band. After only 6-months with another band, Jason ran into none other than Del McCoury, whom he promptly propositioned for a job, which was dully granted. Jason like most other Jason Carters, Jason Carter of the Del McCoury band is a no-holds barred, see what you want and take it kid of guy.